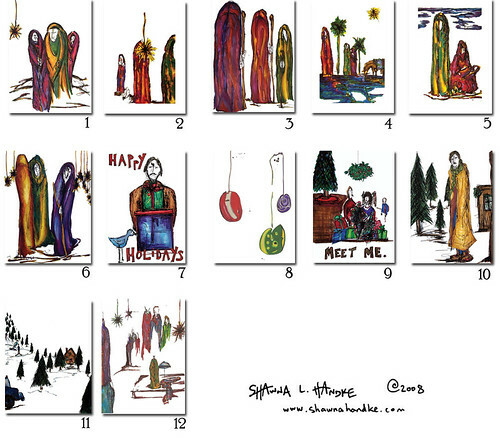 I've just finished editing all of the xMas cards for this season, and they're being printed as I type. So this means that they'll be ready for shipment on Monday! There are a total of twelve illustrations to choose from this season, and six of those are brand new just for Christmas 2008. Check them out, and place your order now. And now for your entertainment, enjoy this silly animation by Tom Eaton. You see, Sufjan Steven's Songs for Christmas album is how I got in the mood to create the new illustrations earlier this year.